Nature produces diamonds in every imaginable colour, with over 300 shades and hues having been identified to date. However, it is estimated that only one in 10,000 diamonds has a ‘fancy colour’. The premium prices commanded by ‘fancy coloured’ diamonds are dependent on their tone, saturation and distribution of colour. A diamond usually comprises more than 99.7% carbon, but the remaining 0.3 per cent constitutes traces of impurities of other elements during its formation. A diamond’s colour is generally determined by such chemical impurities, but it can also be caused by a distortion of the crystal lattice. 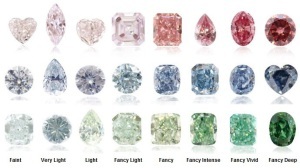 Coloured diamonds require different considerations to colourless stones when determining their value. The hue of coloured diamonds is graded in two ways. The first factor considered is the stone’s basic colour, i.e. blue, pink, yellow etc. The second factor is the colour’s intensity; usually the more intense the colour, the rarer and more expensive a diamond will be. The intensity of the colour saturation grade ranges from ‘faint’ to ‘fancy vivid’ (see chart on right). Blue diamonds are one of nature’s most special treasures. They are so rare that there are no official statistics on their recovery, however Petra’s Cullinan mine in South Africa is known as the world’s most important source. The natural blue colour is derived from small amounts of the chemical element boron trapped in the crystal carbon structure during their formation. A diamond can be blue with less than one boron atom per million of carbon atoms. 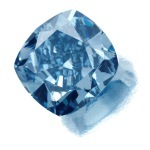 Virtually every blue diamond described by the GIA Gem Trade Laboratory as ‘blue’ is classified as a Type IIb diamond. The incredible rarity of blue diamonds, along with the rich history associated with many of the more important stones, has made them historically associated with rank and wealth, and today they are one of the world’s most highly valuable and collectable items. There have been a number of prominent blue diamonds coming to market recently, including the sale of a 9.75 carat fancy vivid blue diamond by Sotheby’s in November 2014 for US$32.6 million, equating to a price per carat of US$3.34 million. Petra has recovered and sold a number of important blues since taking over the Cullinan mine. Pink diamonds have only been found in a handful of mines throughout the world, with the Argyle mine in Australia being the most consistent source of pinks and the very occasional red diamond. 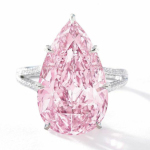 The pink colour in diamonds is thought to be brought about by an alteration to the stone’s molecular structure, possibly caused by some kind of seismic shock at the time of the diamond’s formation. Scientists speculate that this led to an atomic-level lattice defect that can selectively absorb light in the visible region of the spectrum. This colour centre is often concentrated in parallel planes (i.e. graining) within an otherwise nearly colourless diamond. More scientific investigation is currently underway into how pink diamonds obtained their colour. Pink diamonds are one of the most highly coveted of all the fancy colours and have been achieving record prices at auction recently, including an 8.41 carat pink diamond sold for US$17.8 million at a Sotheby’s auction in October 2014 – equivalent to US$2.1 million a carat. Petra’s Williamson mine in Tanzania is renowned as a source of ‘bubblegum’ pinks of the highest quality, including the 23 carat Williamson Pink, which is considered the finest pink diamond ever discovered. The Koffiefontein mine in South Africa also produces the occasional fancy pink stone. Yellow diamonds have long been valued and prized but they were only discovered very sporadically until the late 1860s in the Cape Province in South Africa, where their relative abundance prompted the name ‘cape stones’ – a term that continues in usage today. In fact the first diamond discovered in South Africa, by the Vaal River in 1866, is yellowish in colour and was cut into the 10.73 carat Eureka diamond. The yellow hue present in diamonds (to varying degrees) is due to the presence of nitrogen within the crystal structure, where a carbon atom is replaced by nitrogen. The other defect that is known to cause diamonds to be yellow is hydrogen impurities, however this is far rarer. A wide range of saturations exist for yellow diamonds – as with all coloured diamonds, those of the purest ‘fancy vivid’ yellow are rare and therefore command a very high price. 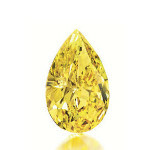 Notable recent yellow diamond sales include the Graff Vivid Yellow, a 100.09 carat VS2, cushion-shaped, fancy vivid yellow diamond ring that was sold by Sotheby’s in May 2014 for US$16.3 million – a world auction record for a yellow diamond. Petra produces yellow diamonds from all its operations. 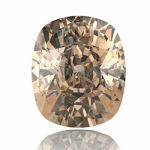 Champagne diamonds are light brown in colour, whereas cognac diamonds have a more orange-brown hue. Champagne/cognac diamonds have a vast range of tones, ranging from very light to very dark, often with modifying colours also present, such as a hint of orange, red or yellow. The largest faceted diamond on record, the 545 carat Golden Jubilee, is golden brown and was polished from a huge stone recovered from the Cullinan mine in 1986. The Golden Jubliee was presented to the King of Thailand in 1997 to commemorate the 50th anniversary of his coronation. Petra’s Cullinan mine produces a regular supply of champagne diamonds. These beautiful stones are becoming increasingly fashionable but are still relatively inexpensive in comparison to other fancy coloured stones. Pure orange diamonds are incredibly rare and therefore highly coveted by collectors. The orange tone is usually caused either by the presence of nitrogen or by an absorption band centered at approximately 480 nm. In order to be considered orange, there must be no hint of brown in the stone. A 14.82 carat fancy vivid orange diamond appeared at auction in December 2013 and was sold for US$35.5 million setting a world record for such a diamond. 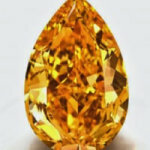 This stone is around three times the size of the two other known large orange diamonds: the 5.54 carat ‘Pumpkin Diamond’ and a 4.19 carat fancy vivid orange diamond sold at auction for US$2.95 million in October 2011. 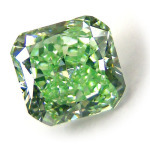 Natural green diamonds are exceptionally rare, second only to red diamonds in their rarity. They are believed to owe their colour to millions of years of exposure to radioactivity, emitted by uranium compounds. The vast majority of green diamonds are only green in their rough form, with stains or coatings on the surface of the stone being responsible for their colour, which tend to be lost in the cutting process – these are known as ‘faceted’. Although all natural fancy coloured diamonds are extremely rare, none are more so than the red diamond. Found mostly in Africa, Australia and Brazil, red diamonds are so rare that only around 20 to 30 true red diamonds are known to exist and most are less than half a carat in size. Unlike other fancy colour diamonds that derive their colour from impurities, red diamonds are made purely from carbon, just like colourless diamonds. The red colour of the diamond is created by a rare deformation in its atomic structure, also known as ‘plastic deformation’. When a red diamond is retrieved from underground and light is allowed to pass through the irregular lattice, the unusual bending of the light causes the diamonds to reflect a ruby-like colour. 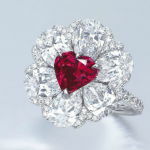 Due to their incredible rarity, red diamonds hard ever come to market, but in November 2014 a heart-shaped 2.09 carat red diamond ring by Moussaieff sold for US$5.09 million, or US$2.44 million per carat to a private Asian investor.